"The delicate exactitude with which he reproduced the impression given to his own alert nerves by unfamiliar forms, colours, sounds and perfumes" is how a contemporary critic describes the cadence literary style of Pierre Loti, French author of "Aziyadé". The exoticism and decadence of the Near and Far East at the core of the romanticism of the 19th century thus provides the backdrop for the newest fragrance by Parfum d'Empire, Aziyadé. A fragrance inspired by the indolent life of a harem at the twilight of the Ottoman Empire. "Aziyadé" or "Constantinople" is a semi-autobiographical novel (1879), based on the diary by Pierre Loti (nom de plume of Louis Marie-Julien Viaud), kept during his 3-month stay as a Naval officer in Greece and Constantinople in the fall/winter of 1876. It recounts the then 27-year old Loti's illicit love affair with a 18 year old "Circassian" harem girl, Aziyadé. Although one in a string of conquests, a gold ring with her name on it worn for the remainder of his days suggests otherwise. Loti's "friendship" with a Spanish man servant named Solomon provides the intrigue of a love triangle in which some tone of homosexual affair is hinted. Loti, a pseudonym derived from an Indian flower which loves to blush unseen, excels at this literary species of confession, half-way between fact and fiction. But the protagonist remains the omnipresent fascination with the opulence of the East with its inherent sensuality (as reflected in his other works (L'Inde (sans les Anglais), Les Derniers Jours de Pékin, and Madame Chrysanthème), influencing such aesthetes as Marcel Proust and John Luther Long. The English translation by Marjorie Laurie, no longer in copyright, however contains sanitized descriptions of harem life, prostitution and homosexuality, while the original French first edition is a highly prized collectors item (you can download it free here). It is of course unfortunate and bitterly ironic that when the modern western observer thinks of harems eyes glaze with the promise of nubile forms sleathed with aromatic oils, emerging through the steamy vapours of an intoxicating mirage. These notions of a place where women dependent on a single man are ready at any moment to satisfy his every whim were honed by opulent odalisques painted in sweeping brustrokes by Ingres and the playful libretto of the Mozart opera. Historical evidence shutters that illusion however with its harsh reality of violent abductions, cruel enslavement and snarly political chess-games; fate was harsh not only to women but to men too ~the atrocious practices reserved for the sandali eunuchs curl the blood. 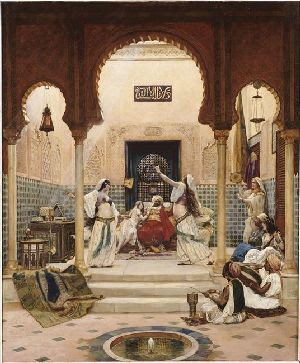 Slave concubines for sexual reproduction emphasize the patriarchal nature of power ("hereditary" through only male heirs). Unlike wives they had no recognized lineage, while the latter were suspected to have vested interests in their own family's affairs, interfering with their loyalty to their husband. This system made concubines preferrable, if affordable. Therefore slave concubines as an equal method of reproduction without the risks of marriage (mainly that of the potential betrayal of a wife, thus questioning an heir's paternity) became a solid custom. In Parfum d'Empire Aziyadé, the scent doesn't correspond to the Valide Sultan for whom Shalimar might fit glove-like, but to a young concubine destined to become kadin, his favoured wife. Those quintessential spices of Near East orientalia, cardamom and cumin, exhale their dangerous yet strangely comforting breath upon the proceedings like the steam rising from a Chai cup offered in supplication. The redolence of richly sweet dates, oranges and prunes predisposes to recast one's mind to that dried-fruit souk alcove that is Arabie by Serge Lutens, but also the 80s Cresp reformulation of Femme by Rochas with its stewed prunes dusted with cumin. Carob is another Near East reference: Ceratonia siliqua, the scientific name of the carob tree, derives from the Greek κεράτιων, “fruit of the carob” (from keras [κέρας] "horn" due to its shape). Its fruit is sweet, succulent with a chocolate-y warmth edged in bitterness. Balanced between sweet and acidulous facets, Aziyadé would be appealing to those who find the abundance of Arabie inviting and accordingly excessive to those who don't. Parfum d'Empire is a French niche line established by Marc Antoine Corticchiato in 2003 painting olfactory portraits of the great Empires of the past from the Alexander the Great (Iskander) and the Romans (Equistrius), through the Mongul Empire (Fougère Bengale) and the Russian Tsars (Ambre Russe) to the Chinese Empire (Osmanthus Interdite), the Ottomans (Cuir Ottoman) and Napoléon (Eau de Gloire) with Joséphine (Eau Suave). Available at 50ml/1.7oz (95$) and 100ml/3.4oz (130$) at Luckyscent and soon online at the official site. Painting Les Almées by Paul Louis Bouchard via chapitre.com. Clip of Arabian dance from Nutcracker Suite by P.I.Tchaikovsky from the Mariinsky Theatre ballets' performance in St.Petersburg, originally uploaded by radostsguy on Youtube. What a lovely background ! I find this gorgeous- but I realize that the cumin could put a lot of folks off. [BTW- look for the postman ! You always make me guffaw ! Love ya right back, sweetie! Cumin has a bad reputation: I don't really know why, I never get "sweat" from it. I love cumin. Well, when one "reads" it as a culinary note immediately, I don't think there's any danger of sweat entering the equation. It just adds to the dimensions of the fragrance. You have a point about the Coca-Cola part (there is something that I call "bittersweet vanillic boozy" usually, which is the thing that CC gives me). LOVE your description!! How apt! Awww, isn't it sweet to see you ladies talk to each other. Arabie is a funny one (love your reference) and it strikes me as odd that I like that much: too many fruits is usually something out of my comfort zone, but there they somehow work. It's rather rich, I agree most eagerly. I've just about had it with spamming from fake "blogs" and "readers" that advertise their companies. Get in line and propose a decent rate if you want to use this venue for advertising and be prepared to go through evalutation for acceptance of it, please! I adore this type of fragrance. Dense, resinous, with tons of dried plums. This smells to me exactly like my beloved Femme Rochas EdP (not EdT) + Coca Cola note (that is annoying me). It would be so perfect without that note (I blame it on pomegranate). how can I resist you the nostalgia and romanticism? Indeed those eras have attained something mythical.